Earlier this month I posted my third PQL review, this one on Jessica Grant’s Making Light of Tragedy and Caroline Adderson’s Bad Imaginings. Both books deal with the changing roles of women in modern society and often offer us perspectives that shock and surprise us. Ms Adderson’s book in particular offers its readers women who never wanted children, housewives who forsake their husbands, and career women who opt out for matrimony. For all the surprises, Bad Imaginings offers a fresh perspective for women in the twenty-first century. 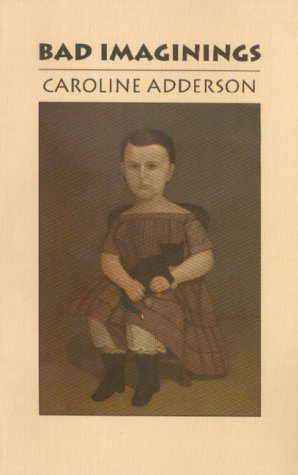 Caroline Adderson is a reader and writer of many books. Titles to her name to date include three novels (A History of Forgetting, Sitting Practice, The Sky is Falling) and two collections of short stories (Bad Imaginings and Pleased to Meet You). Her work has been nominated for several awards, including the Governor General’s Award, which Bad Imaginings was nominated for in 1993. She also writes books for young readers. 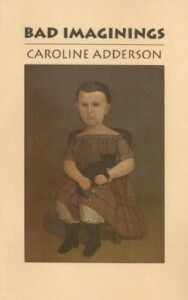 Bad Imaginings is Caroline Adderson's first published work. Porcupine’s Quill: Most of the stories in Bad Imaginings are about mothers—grandmothers, single mothers, bitter mothers, abusive mothers, abandoned mothers, mothers and their mothers…. Is there a reason why so many of these stories are, directly or peripherally, about motherhood? Caroline Adderson: That’s an interesting take on the book. In actual fact, when I first conceived the collection (ha ha), it was to write a book of stories about children. It only follows, of course, that these children will have mothers. PQ: Perhaps the most striking mother in the collection is the first one, which we meet in “Shiners.” Not two pages into the story she admits that she “was never interested in children” (Adderson 10). I have to admit, it was a shock to read because generally that’s not something you hear talked about: women who don’t want children. Why did you decide that would be the case in this story? CA: That character is the grandmother to Thad, the protagonist, and Laurence, his younger brother. I wanted to create a portrait of a woman of that particular generation, my own grandmother’s, one that had few options. Not having children wasn’t one of them, so she ends up with a bunch of her own then all the attendant grandchildren who keep coming to her, no one suspecting her indifference. It’s her expected role and she plays it uncomplainingly. One challenge I continually set up for myself as a writer is to embrace characters who are very different from me. That’s the case here. This woman might be considered an anti-feminist. In addition to her role of reluctant grandmother, she is the primary caregiver to her long-time husband now disabled by a stroke, with whom she is still passionately in love despite their difficult marriage. The man was unfaithful and, at times, abusive, and here she is spoon-feeding him his supper without a trace of bitterness over their past. All she resents is his present diminishment. I’m quite sure I would feel differently. Women are always asked to be “this” or “that.” Now that we have choices, we are expected to make and stick to them. PQ: A good example of positive mother-daughter interaction comes in “The Planet Earth.” When Barbara goes through her separation with Doug, she confesses that if she could go back she would have done “exactly what her mother had told her” (75). Likewise, advice from Denise’s mother (albeit, gleaned after the woman’s death) leads Denise to change her entire life. It’s interesting that in “The Planet Earth” both Barbara and Denise learn from the actions of their mothers. Do you think the mothers and daughters have a special connection in that way? CA: I definitely do now, but I’m not sure I thought that when I wrote this story. Bad Imaginings was published in 1993 when I was 29 years old. It took me six years to write, so some of the stories in the book are a quarter century old. I haven’t read it myself for many, many years, though I was tempted to reread this particular story to answer your questions. In the end I decided that the reader I am now would interfere too much with the memories of that long-ago writer. Since 1993 I’ve become a mother myself and have lost my own mother, two events I could never have accurately imagined, they so rearrange your psyche. So, to answer your question: yes. It’s a very deep connection. There’s a phantom umbilical cord there that you don’t know about until it is finally cut. PQ: “The Planet Earth” is a funny story and was definitely one of my favourites in the collection. In it you trace the lives of two women who for the first half of the story behave fairly predictably. One marries and becomes an unhappy housewife, the other never marries and becomes and cold career woman. However, halfway through you completely flip their roles. Why did you make that choice? CA: I guess I was playing with how limiting those roles are. Women are always asked to be “this” or “that.” Now that we have choices, we are expected to make and stick to them. Yet no matter what choice we make, we’ll be harshly judged. Last year we had the excoriation of the Tiger Mom. This year it’s the excoriation of the Attachment Mother. Notice the dads get off scot-free? When I first conceived the collection, it was to write a book of stories about children. It only follows, of course, that these children will have mothers. PQ: There are definitely feminist tones in “The Planet Earth.” Would you consider yourself a feminist? What does that word mean to you? CA: Of course, I am. To me feminism simply asserts that women and men should have equal opportunities, pay, choice, etc. PQ: Overall, many of the stories in Bad Imaginings have very dark undertones. However, there are also some moments that surprised me, full of light and humour. What was your favourite story to write in the collection? I can’t really name a favourite story, though there is one that I think advanced me as a writer. In writing “Gold Mountain” I became more conscious of the language I was using and started to understand that a story, like a poem, is language-driven. The story is set during the Gold Rush of the 1860s. To capture the flavour of the period I read a contemporaneous prospector’s journal and studied Dickens. Consciously manipulating syntax and vocabulary forced me to write on a word-by-word level. I don’t think I really understood what I was doing with words before that. Also, the story—a tragicomedy!—was a lot of fun to write. Thanks to Caroline Adderson for being so kind as to answer my questions! If you have anything to add or any questions for Caroline Adderson, please feel free to leave a comment below or send me an email at pqlporcupettes@gmail.com. Until next time … Porcupette out! Adderson, Caroline. Bad Imaginings. Erin, Ontario: The Porcupine’s Quill, 1993. This entry was posted in Letters from the Porcupette (the Intern's Blog) and tagged Bad Imaginings, Caroline Adderson, feminism, The Porcupine's Quill. Bookmark the permalink.